A Conservative candidate in a west London by-election recently attended a fundraising event for the Labour Party and was photographed with Tony Blair. 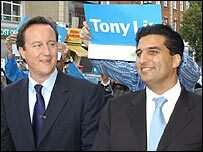 Tony Lit, standing for MP for Ealing Southall, was head of Asian radio station Sunrise at the time. Sunrise donated £4,800 to Labour at the event. Labour said it showed Conservative leader David Cameron lacked judgement. But the Tories said last month's event had been billed as a dinner for the Asian business community. Mr Lit, who has since quit his job as managing director of Sunrise Radio, said: "As a businessman I did indeed attend this event for the Asian business community. "But like many British Asians I feel the Labour government does not have the answers to the challenges that currently face the country." Joan Ryan, a Labour vice chair who is running the by-election campaign, said it was "breathtaking and naked Tory opportunism". "David Cameron may lack judgement with his choice of candidate but the voters of Ealing and Southall will see through this charade," she said. Conservative Party sources close to Mr Cameron say they were aware that Mr Lit had attended the "Celebrating Diversity" dinner and were "relaxed" about it. They claimed that Labour were pushing the story now because they were "rattled" about doing badly in Ealing. The by-election takes place on Thursday and follows the death of Britain's oldest MP, Labour's Piara Khabra, who was 82.